Manitoba Society of Occupational Therapistsenabling ability by building the occupational therapy community. 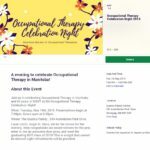 Occupational therapy is an essential health service dedicated to helping people achieve independence, meaning and satisfaction in all aspects of their lives. Whether it is in the home, hospital, community, school or private practice, occupational therapists are available to help.